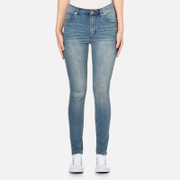 Women’s ‘Second Skin’ blue jeans with a high rise and a faded wash from Cheap Monday. Crafted from mid weight stretch denim, the stretchy five pocket jeans are detailed with a rip on the knee, whiskers on the thighs and silver finish hardware. Complete with a top button closure and zip fly, belt loops and a tan leather brand patch on the rear waistband. 83% Cotton, 16% Polyester, 1% Elastane Model is 175cm/5'9 and wears a size W27/L30.